Among the books on spiritual development that appear it is not often that one comes across a work that has anything new to say — the platitudes thunder forth all to predictably. But here we have the exception, a book that really does offer some fresh insights into spiritual practice, and indeed some varieties of practice that the reader may not have encountered before. The core of the author’s approach is accurately given in the title. 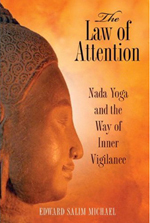 One of the first things he says is: “man’s attention is the most precious thing he possesses…” For it is the use of attention that produces all things good and bad in our lives – and can be the main key to that constant self-awareness of body, thought and deed that constitutes the path to enlightenment. ‘Self remembering’ he calls it and the drop into our habitual ‘sleepwalker’ state of consciousness is a backward step. Awareness of one’s own actions is essential because the repercussions can go on a long time. 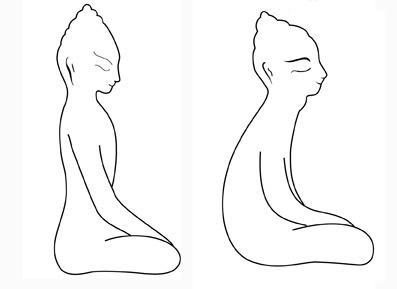 Whatever occupies our thoughts too much, he says, invariably permeates and obsesses our being – so be careful. And a point too often ignored: that ‘enlightenment’ does not mean the end of effort but only the beginning of a long struggle against adverse forces. He ends with some excellent chapters on sadhana, enlightenment and right effort. ln reviewing a book of spiritual teaching such as this one faces a profound disquiet. There are probably few people on this Earth who are capable of judging this presentation of the author’s teachings from an equal or superior position of personal development; ‘whereof one does not know, thereof one must remain silent’. Which is to say that this book impressed me with its power and integrity. However, the central theme of the teachings is the absolute requirement for personal honesty, the spiritual ‘hygiene’ which is a necessary preparation and constant factor for those drawn by the desire for the liberation from ignorance – which is the sin of ‘self-forgetfulness’. Thus the reviewer must adopt the position of an honest, critical meeting with the author, without seeking to judge what one cannot. Salim Michael with no formal education has devoted his life to the search for spiritual enlightenment and thence teaching to a small band of devoted pupils in Paris. The completion of this book took a painful four year’struggle, compelled mainly by the desire to leave something of his teachings to his pupils, as well as a spiritually lost ‘agonising humanity’ after his death. The reward of this labour of love is a work which is clearly and simply written through which the light of the author’s spiritual experience and development shines through, despite detracting factors of language. Salim Michael’s background and teaching is in the Hindu yogic tradition. However, in structure and content, this book is akin to ancient works associated with legendary teachers, in that it does not directly deal with specific techniques, but with fundamental issues of attitude and approach to spiritual development. With this in mind (and remembering that the work, is indirectly, an account of the author’s own struggles) the book appeals to all who feel the ineffable pull of the divine within them, and not merely the yogic aspirant. Readers who are familiar with the yogic philosophy and practice will recognize much, but so, also, will all who seek beyond doctrine, dogma, and intellectual understanding for the personnal experience of the divine ‘higher self’ which resides in all human beings. Quakers, in particular, will recognize Michael’s teaching of the development of a ‘silent witness’ in everyday life. The strong moral imperative (so different taken from the personal, existential position, as opposed to the authoritarian position of doctrinal law) to be aware of one’s own ignorance and the demands of a selfish ‘lower nature’ and the painful process of ‘dying to oneself’ in the need for redemption, will equally impress. Salim Michael learnt nothing of value from books; only direct experience, or ‘knowing’ will do. Indeed, in Salim Michael’s case, book‑learning was impossible until he was in his 20s because he was totally illiterate, able neither to read, write nor add up. Thus it is he writes as I would like to imagine all the truly great teachers of the past would have written (if they would have written at all, which must be in some doubt). He is in absolutely no doubt of the existence of the Divine Source, as he calls God, because he has experienced that ‘knowing’. The book is consequently packed with uncompromisingly honest observation, insight and advice I find hard to fault, written in a style that moves as much as it instructs and informs. Thus, in his preface: “I have found that people have a curious tendency that as soon as they can give a thing a ‘name’ they believe they know all about it and can then, with a clear conscience, leave it aside and forget it. Thus 1 have deliberately avoided calling certain things by their commonly‑used names to stimulate the desire and the feeling in the reader to seek. Chapters on one’s attitude when alone (“he will be greatly deceiving himself if he believes he can conduct himself in his private life in any way that suits him.. . .”), while walking outside (“the imperative need there is to remain in a state of self‑recollectedness in action also.. and not only when quietly meditating behind the walls of a monastery”), seeing and hearing (“he generally looks but does not see, he listens but does not hear”) illustrate graphically Salim Michael’s total ‘knowing’ from his own experience. Strangely, and this is perhaps an example of the ‘something for everyone’ quality that is the mark of this book, the sentence that struck me most was not from the chapters on such ‘philosophical’ questions as ‘Man and woman’, ‘Mother and child’,’Food and man’ as I would have expected, but the final remark in his passage on ‘The trace that thoughts, words and deed leave’. I unashamedly confess a lump came to my throat at that point for I realized that this is precisely what Salim Michael has achieved and what this rare book represents.